Peptide (C)RDNKIHSIRKSHFVD, corresponding to amino acid residues 383-397 of mouse Slitrk1 (Accession Q810C1). Extracellular, N-terminus. Homology Human – identical; rat – 14/15 amino acid residues identical. 1, 2. Anti-Slitrk1 (extracellular) Antibody (#ASR-081), (1:200). 3, 4. Anti-Slitrk1 (extracellular) Antibody, preincubated with the control peptide antigen. 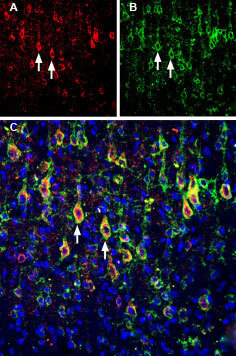 Immunohistochemical staining of perfusion-fixed frozen rat brain sections using Anti-Slitrk1 (extracellular) Antibody (#ASR-081), (1:300), followed by goat anti-rabbit-AlexaFluor-488. 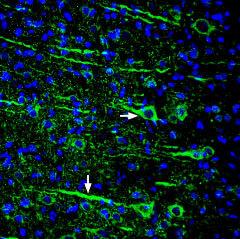 Slitrk1 staining (green) in the rat parieto-temporal cortex is detected in pyramidal neurons (horizontal arrow) and their dendrites (vertical arrow). Cell nuclei are stained with DAPI (blue). Aruga, J. and Mikoshiba, K. (2003) Mol. Cell. Neurosci. 24, 117. Beaubien, F. et al. (2016) Sci. Rep. 6, 27343. Neurites are key morphological features of neurons, and are classified into axons and dendrites. Leucine-rich repeat (LRR) domains are often found in neurite development-controlling proteins. Slitrk proteins are leucine-rich repeat containing transmembrane proteins, parts of which are similar to Slit and neurotrophin receptor. All six members of the Slitrk family, including Slitrk1, contain putative hydrophobic signal sequences and membrane-spanning regions. Slitrk1 is strongly expressed in the subventricular zone of the cerebral cortex, the pyramidal cell layer of the hippocampus and in the thalamus and hypothalamus1. Slitrk1, can regulate synapse formation between hippocampal neurons. Slitrk1 is enriched in postsynaptic fractions and is localized to excitatory synapses. Overexpression of Slitrk1 in hippocampal neurons increases the number of synaptic contacts on these neurons. Furthermore, decreased expression of Slitrk1 in hippocampal neurons leads to a reduction in the number of excitatory, but not inhibitory, synapses formed in hippocampal neuron cultures. In addition, different leucine rich repeat domains of the extracellular region of Slitrk1 are necessary to mediate interactions with Slitrk binding partners of the LAR receptor protein tyrosine phosphatase family, and to promote dimerization of Slitrk1. In addition, Slitrk1 binds with PSD-95 through its intracellular tail. Thus, through PSD-95, Slitrk1 regulates signaling of NMDA and AMPA receptors2. Anti-Slitrk1 (extracellular) Antibody (#ASR-081) is a highly selective antibody directed against an epitope of the mouse protein. The antibody can be used in western blot and immunohistochemistry applications. The antibody recognizes an extracellular epitope, and could potentially be used for detecting the protein in living cells. It has been designed to recognize Slitrk1 from mouse, human, and rat samples.